Warning to all bike thieves! My old Rivendell road bike was stolen in June. I’d had it for a long time and losing it did hurt. I think stealing a bicycle like that is more than just a little misdemeanour; it is a wicked crime and shows really bad character. The only way I could get over the loss was by going to see Bradley Woehl at the American Cyclery in San Francisco and have him build me a new bicycle. 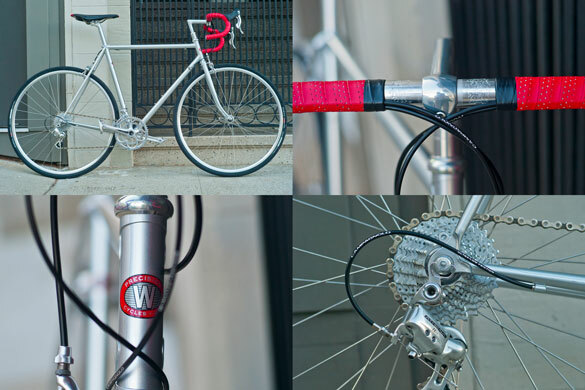 The frame is made by Waterford in Wisconsin, the paint job is pretty much the same as my Rivendell and the parts are mostly Campagnola. We put 28 tyres on it, which looks less elegant than 23, but if you have seen the roads here in San Francisco, you know that even that is too thin. I’m publishing a few pictures here as a public record. If anybody dares steal this bike, there’ll be lots of people looking out for it. Stephen Coles interviewed me about the history of FontShop. 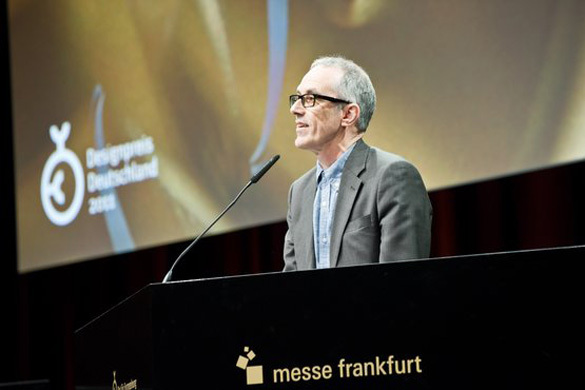 John gave this short speech on the occasion of me receiving the Lifetime Achievement Award from the German Design Council. When I went to Berlin a couple of years ago, in preparation for Eye 74, our Berlin special, I kept running into Erik Spiekermann. Not literally, though I did later spend a pleasant evening in the company of Erik and his wife Susanna. But I quickly realised that I couldn’t avoid encountering Erik and his legacy. For a start, nearly every person I met had some connection to him: either they had collaborated with him, or worked for him, or they’d been taught or otherwise encouraged by Erik early in their career. And even people who didn’t know him very well, or who had never met him, seemed to have an opinion about him. They knew him as a designer, as a typographer, as a type evangelist and as a writer – chiefly on the subject of typography, but with opinions about every other subject: politics, society, culture, art, music and so on. Also, quite apart from all the people I met, there were traces of Erik everywhere I went, on the subway, in the signs and the many different civic and commercial public projects that bore the stamp of one of his design practices, or that used one of his typefaces. 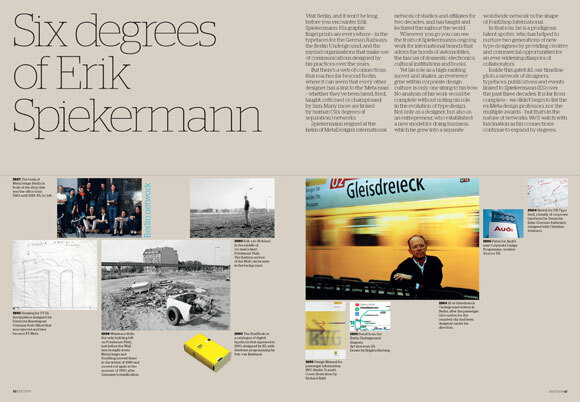 So that’s why we called the Eye 74 piece ‘Six degrees of Erik Spiekermann’. 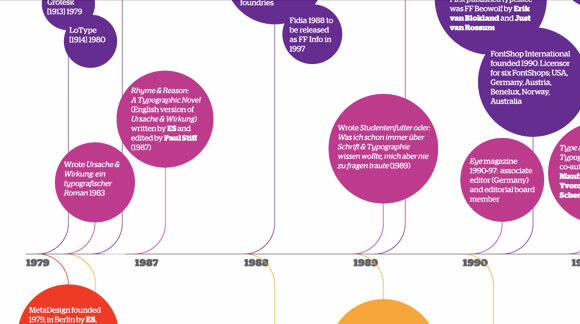 We devoted a gatefold information graphic to all the connections that he had made throughout his career, spanning the years since 1979, when the company that would become Meta was founded, to the present-day activities of Edenspiekermann. Like Kevin Bacon, Erik seemed to connect anyone who was anyone in graphic design, visual communication, branding and typography. Yet if our world were Hollywood, Erik would perhaps be more like Steven Spielberg than an actor like Bacon. Erik is both a generalist and a specialist. The first time I ran into him, at an international typography conference, he asked me how I could stand to be surrounded by so many ‘nerds’? He knows how designers and typographers think, in the most minute detail, because that’s the way he thinks, too. Yet he’s managed to lift his head above the cubicle that all too often restricts the graphic design world, and look dispassionately at commerce and government and charities, taking the time to understand how they think, too. I have daily reason to be grateful for Erik’s advice, since his ideas about the Rundbuero, expressed in Unit Editions’ book Studio Culture, helped me make some changes in the way I organise my own office. William Owen described Erik (in Eye 18) as a ‘consummate pluralist’, while also taking on Erik’s own definition of himself as a ‘typographic designer’, who designs ‘from the word up’, a phrase later used for a slim volume on Meta’s work. William also noted that Erik ‘valued work of a kind he could never or would never want to do.’ But that is not surprising. It is almost the definition of a anyone with a rounded interest in culture and the world at large: you don’t have to sing opera to value Nixon in China, nor do you have to paint in oils to appreciate art. I think it is Erik’s ability to work and show curiosity at both micro and macro levels (and all points between) that makes him a good writer, as well as a good designer. His writing is clear and to the point, whether in a column for Blueprint magazine or in an email containing directions to his house. Even if he had done little else, the book he wrote with E. M Ginger, Stop Stealing Sheep and Learn How Type Works, would be an international calling card of huge proportions, since it’s one of the few genuinely informative, entertaining and readable books about type written in the past few decades. When I first watched the DVD of Gary Hustwit’s Helvetica, whose extras section includes an extended interview with Erik, I was amused to hear him say how much he liked being an ‘unknown designer’. Today’s ceremony seems an odd place to talk about Erik’s lack of recognition. Yet he was making an important point about the role of design – graphic design, type design and typography in particular – in civic life. As Erik explains in that documentary, neatly diverting the director from too many questions about a typeface he doesn’t much care for, a nation’s culture, the stuff that surrounds us, is made of good architecture and building, good food and cafes and supposedly nerdy things like the small type in timetables for public transport, or the signs in stations, or the little details that make your iPhone work intuitively. Erik gets a kick out of being the unknown author behind some of this stuff, even when the money is terrible, and he has to fight ‘the system’ – the conventional way of doing something – to make things just a little bit better. Few people might notice, or remark out loud that the timetable has acquired more legible, readable type, or better navigation, but as Erik would say, ‘That is the point.’ Many designers get a kick out of making things better, or finding a solution, or being part of the team that did that, whether their name is on the finished product or not. So I think we could regard this prize as one that Erik can share, just a little bit, with all the unknown designers out there, who play their part in making our lives better, our small print more legible. Around the time I became editor of Eye, we published an updated version of Ken Garland’s ‘First Things First’,* calling on designers to examine their priorities. The new manifesto included these sentences: ‘Unprecedented environmental, social and cultural crises demand our attention. Many cultural interventions, social marketing campaigns, books, magazines, exhibitions, educational tools, television programmes, films, charitable causes and other information design projects urgently require our expertise and help.’ Erik was one of 33 designers who put their names to ‘First Things First 2000’, and that statement sounds just as relevant today – throw mobile devices and social media into the mix and it still holds good. I agreed to come here on the strict understanding that the Designpreis would not signify or herald any slowing down on Erik’s part. He still works at a furious pace. He even has a proofing press in his house, where he’s cooking up plans to combine digital and analogue, making plates with a laser cutter. And in addition to all the usual client work, he is publishing a series of booklets of writings that he likes, and more little red books of his own work – the thoughts of Chairman Erik. These thoughts are worth sharing. Erik is concerned about nerdy details, yet he loves to construct the big picture. He’s a great advocate of design’s role in civilised society, all the boring, behind-the-scenes stuff, but he is also quick to spot what is new and cool, and to champion and mentor young talent – the new Edenspiekermann scholarship is a significant addition to this aspect of Erik’s life and work. For all these reasons, Erik is a worthy recipient of whatever awards get thrown his way – and they won’t go to his head. Not the best audio or video quality, but a Spiekermann interview online. 60 minutes if you can bear it! Oliver Reichenstein just spoke at TypoBerlin. While he was there, his (Information Architects’, that is) latest Web Trend Map went to Final Beta, Cosmic 140. Oliver pointed out that I also made it into the Top 140 of the most influential Twitterers – or is that Twits? You can download a free PDF of this wonderful piece or buy the lavishly printed poster. The names are sorted by #name #handle #category #influence #activity. 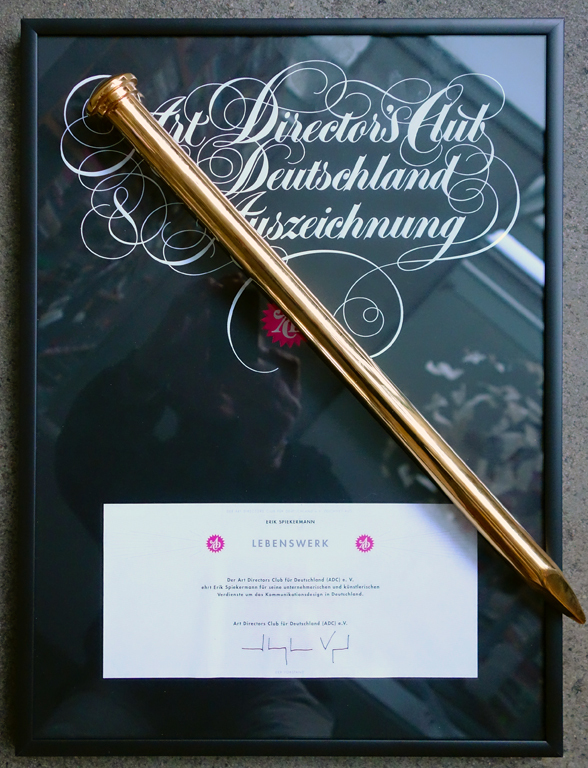 Visit Berlin, and it won’t belong before you encounter Erik Spiekermann. His graphic fingerprints are everywhere – in the typefaces for the German Railways, the Berlin Underground, and the myriad organisations that make use of communications designed by his practices over the years. But there’s a web of connections that reaches far beyond Berlin, where it can seem that every other designer has a link to the ‘Metaman’ – whether they’ve been hired, fired, taught, criticized or championed by him. Many more are linked by human (‘Six degrees of separation’) networks. 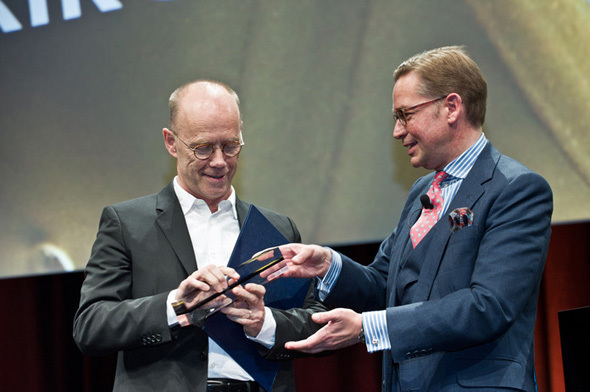 Spiekermann reigned at the helm of MetaDesign’s international network of studios and affiliates for two decades, and has taught and lectured throughout the world. Wherever you go you can see the fruits of Spiekermann’s ongoing work for international brands that adorn the hoods of automobiles, the fascias of domestic electronics, cultural institutions and books. Yet his role as a high-ranking mover and shaker, an éminence grise within corporate design culture, is only one string to his bow. No analysis of his work would be complete without noting his role in the evolution of type design. Not only as a designer, but also as an entrepreneur, who established a new model for doing business, which he grew into a separate worldwide network in the shape of FontShopInternational. In that role, he is a prodigious talent-spotter, who has helped to nurture two generations of new typedesigners by providing creative and commercial opportunities for an ever-widening diaspora of collaborators. Inside this gatefold, our timeline plots a network of designers, typefaces, publications and events linked to Spiekermann (ES) over the past three decades. It is far from complete – we didn’t begin to list the ex-MetaDesign professors, nor the multiple awards – but that’s in the nature of networks. We’ll watch with fascination as his connections continue to expand by degrees. You can download the timeline here. The article is online at eyemagazine. I’ve been involved with TCHO, chocolate makers in San Francisco, as a designer and an investor, for a few years now. Susanna Dulkinys, my wife and business partner, has won several prizes for her work on the TCHO brand and packaging. We have been interviewed about the design aspects, shown the project at conferences and talked to other clients about it. 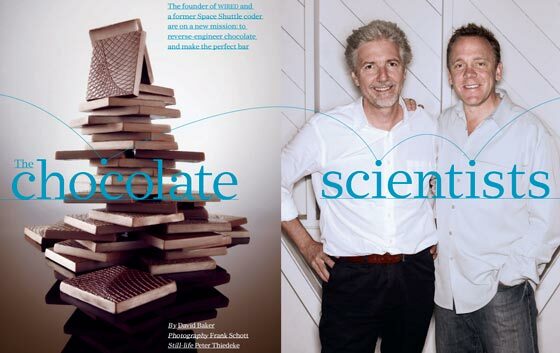 The story of how this amazing chocolate is actually made and why it’s different from other chocolates is told in a feature in WIRED magazine’s UK edition. As it happens, Louis Rossetto, CEO of TCHO, was co-founder of WIRED way back in the early 90s. As this meme has come up a lot recently in connection with the hadopi story about a French governmemt agency using a stolen font for its logo and with Microsoft’s admission of a major security issue, it might be useful to explain where it came from. This video does so.